Only here I want to say something about the reverse process, how I learned to separate Insight meditation out from the photography I was doing and use it on its own, not an easy process. It is a story that should interest at least a few of you. It all happened the spring following that summer where I first learned to mix my mind training with the close-up and macro photography I was doing. The following spring I was out photographing nature as early as January and February, a bunch in March, and constantly by April. And all winter I had been gathering my equipment and upgrading what I could afford. But something had changed internally for me and in a quite unexpected way, but it would take me some months to figure this out. At the time, I was hell bent to immerse myself ever more deeply in nature photography, and my outings were now ranging ever farther from home. Instead of spending my early mornings at the back of the local cemetery, at the fringe where the wild vegetation meets the well-groomed lawn, as I had done the year before, I was now actively planning trips to nature spots all over Michigan. I was studying maps, marking locations, and so on. I became fascinated with Michigan bogs and the life possible in those very special environments. It turns out that bogs only really thrive at latitudes higher than 45 degrees. Big Rapids, Michigan (where I live) is almost 44 degrees of latitude, so we have bogs in this area and just an hour or so north of here are really vast bogs. Why bogs? I have no idea. I am an enthusiast, and there is always something that fascinates me. Perhaps it was that bogs are so very, very fragile, tiny microenvironments that hardly anyone has ever seen, much less spent time in. Isolated from nutrients, since the plant life on bogs can’t get nutrients from below (the peat is anaerobic and won’t let anything through from below), many bog plants have become carnivorous, depending on food from above, insects and what-not. Bog plants include the Pitcher Plant, the Sundew, and the Venus Flytrap, among others. Whatever the reason, I was fascinated by bogs and found myself traveling many hours to visit them and carefully photo-documenting what I saw there. The point here is that I had taken my photography yet another step, not only shooting whatever was available each morning near my home, but now traveling long distances to sample this or that special environment, this particular plant or that one. Without realizing it, my enthusiasm had caused me to overstep the boundary between mixing my Mahamudra practice with nature photography and that of becoming even more of a naturalist than I already was, and I was. From the time I was about six years old until I was in my late teens I had studied nature with a fierce passion, so I already knew about nature. I knew all the little woodland critters, and I knew them well, their habitat, behavior, and life and death struggles. And here I was further upping the ante as far as being a nature photographer was concerned, big time. Yet even in my enthusiasm I could vaguely sense something was slightly off, but for the life of me I could not place the problem. It took time for this to gradually sift out and surface in my consciousness, but eventually it did become clear to me that I did not really want to become a full-scale naturalist once more. This is that story. I was (as I do so often) once again confusing the baby with the bathwater, a bad habit I have. It was like a ‘Mara’, an illusion that confused me. And this all came to a head during a trip up to the top of Michigan’s Lower Peninsula, and thus this story. I had been invited to join a very select group of naturalists who were given permission to enter a rare bog preserve at the very top of the Upper Peninsula of Michigan in order to take a survey of wildlife there. Bogs are very fragile environments and even walking on them is destructive. But this conservation society allowed special teams to enter these closed reserves once or twice a year and I was to be the team’s herpetologist. I had been trained in reptiles and amphibians since I was a child, and so knew all about them. I was geeked. I could not wait to get to Michigan’s wild Upper Peninsula and out on those endangered bogs with my camera. The trip was to last a number of days, and I was up before dawn of that first day and in my car heading north. It must have been around 4:30 AM when I hit the road. The only hiccup was the fact that I had just had some fairly protracted oral surgery (several days of root canal work), and the tooth in question had developed a really nasty abscess beneath it. I was already on my second dose of antibiotics, this time really heavy antibiotics, the first round having not even touched the problem, but I was not about to be stopped by a wayward tooth. Although I was in some pain and my lower jaw was swollen, I assumed that as time passed and the new antibiotics kicked in, the swelling would just naturally go down. Anyway, hell or high water would not have kept me off those bogs, so on I went. My first stop was at a small bog at the top of the Lower Peninsula, just before you get to the great Mackinac Bridge over to the Upper Peninsula. I was out on the bog in the full morning sun by 8 A.M., already hours from my home. It was a magnificent crisp morning. Yet I was still having trouble with that dumb tooth, a certain amount of throbbing punctuated by needle-like shots of pain in my jaw. I did my best to ignore it and again told myself that it would die down. There I was in my hip boots, far out on the surface of the bog, surrounded by moss and small bushes, and carefully stepping my way along in the ooze. Each step made a suction sound as I lifted a leg and then placed it back in the thick matrix of the bog. Moving was very slow. I was maybe halfway around the periphery of the small lake-bog when I first saw them, a pair of large Sandhill Cranes picking their way through the bog on the opposite side. I was thrilled to see them and they were incredible. As I threaded my way along I must have somehow began to encroach on the area where they perhaps had their nest, for they became increasingly animated. Now these are large birds. They can stand five feet high and have wingspans of six to seven feet across. And their piercing red eyes were on me, and they were not just casually looks. Then slowly I realized they were moving in circles around me. 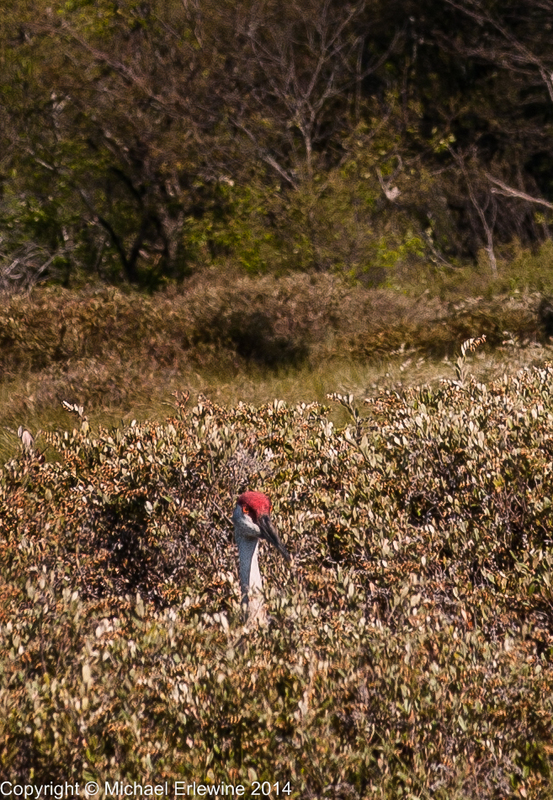 Many of the bushes on the bog were several feet high, so I could not always see the cranes, but I could hear their frightening calls. I didn’t say ‘frightened’ calls; I said frightening calls, which they were – eerie. And then the cranes began running through the bushes, circling me closer, working together, and they moved fast. Much of the time all I could see through gaps in the bushes was a sideways profile of one of their heads as they circled me. I could see one bird as it ran through the bushes on my right, and then suddenly on my left, there was another bird circling in the opposite direction. I was constantly off balance, and I had to watch my every step lest I step into muck so deep that I would begin to sink down in it. I was carrying over $12,000 worth of camera equipment, not to mention my life. Bogs, like quicksand, can be treacherous places. One of the birds would rise in the air and cut directly across my path (only a few feet in front of me) only to disappear into the bushes and take up running around me again. And the cries were now getting really scary. At some point I began to feel like I was being stalked, and visions of the movie Jurassic Park and velociraptors came to mind. These were very large birds and they didn’t like ME. It is easy for me to see how birds were once reptile-like creatures. Well, that is as far as it went. I finally managed to plot a course through the bog that apparently took me on a route away from their nesting area, while all the time I was moving one gooey step at a time very slowly through the muck. I finally got out of there, found my way back to the car, and drove to the nearest town. By this time it was beginning to be clear that my tooth was not going to just calm down, but instead was only getting worse. I had super strength Ibuprofen and even some Vicodin that the dentist had given me, so I had to dip into those a bit. And this was just the first morning of the first day of a five day journey. I had to decide what I would do. I went to visit some friends who lived in a nearby city to where I was. I was now safe in a nice home in a town only a few hours from my home. But I had the strange experience of feeling that I was somehow embedded in a scene at which I was no longer fully present. Part of me was elsewhere. It was like a dream or a movie set in which I was only an actor. In other words, I was beside myself. At the same time I was kind of leaning out of it, like you might lean out the back door to get a breath of fresh air. Something had stirred or moved inside of me that day and I was damned if I could figure out what it was. Somewhere back in there I had lost my incentive or my direction. Perhaps these combined events with the birds, my tooth, etc., schooling (like fish), now appeared as signs that pointed that something within me had changed at the core. Yet by tomorrow I was supposed to be across the Mackinac Bridge and at the tip of the top of the Upper Peninsula, hours from where I was now, and out on those remote bogs, miles from any town (much less a hospital), and the temperatures up there were predicted to be very cold, even for a spring day. After all, way up there it was still hardly spring. Hmmmm. What's the message here? In the end, the throbbing of my tooth and those little sharp spasms of shooting pain told me that marching through a bog for a few days, miles from anywhere, might not be the time to try and push this 67-year old physical envelope. As it turned out, that was the right decision because the second round of antibiotics with its very large dose also failed to do the trick. My abscess overcame all attempts to control it and spread much farther into the bone of my lower jaw. In the end, the tooth had to be extracted and the jaw treated. And I only tell this longish story because this became a real turning point for me. I will try to explain. Like so many times in my past, I had once again managed to confuse the inside with the outside, the important with the unessential. What had been going on over the last year was that I was now using the outside (nature photography) to look at the inside (my mind) AND I had fallen into the mistake of confusing the two, which was easy to do. Since it was through photographing nature up-close very exactly that I was realizing something about the nature of the mind, I began to elevate photographing nature as the goal or object of my passion, when it was only the means through which I was experiencing a glimpse at my mind’s nature, which is my real passion. I hope that makes sense. Here I was, trying to upscale my nature trips when all they were to me in the end were the lens or means through which I was viewing the mind itself. It was the seeing nature of the mind that was illuminating. And here I was, buying more equipment, planning longer and more extensive trips, and ordering every kind of field guide I did not already have, and I have shelves full. Well, this all changed, and that early morning faceoff with the Sandhill Cranes was perhaps the turning or pivot point. That experience was thrilling and not really that scary, so I was not scared off by what happened there. But something else did snap around that time and I woke up from that particular dream. It seems I wake up from dream within dream from within dream in life. After that I began to realize I was unnecessarily further complicating my life with all these lenses and nature trips, when what I wanted to do was simplify it. I was extruding the naturalist in me at the expense of the simple clarity of resting my mind when out in nature, and it was the clarity of the mind that I was in love with, albeit, as seen through the lens of nature. It is the old baby and the bathwater thing. I had once again confused the two, but I am getting a little ahead of myself. Let me summarize. Quite early on in the spring of that year I began to notice that the very special lucidity that came when I patiently peered through the camera lens, waiting for the wind to die down (or whatever), was now present without any camera at all. What before was made possible only by my intense concentration and a really tack-sharp lens had now overflowed and begun to mix into the rest of my life. Then one day I realized that I did not even have to bring a camera along with me out into nature at all. What a thought! This clarity that I had very carefully nourished the entire preceding year through my photography had become the rule rather than the exception. It was not about cameras; it was not about lenses, but about clarity of mind. That was it, and I began to realize this. I finally understood what was troubling me way back in there and I am so glad I did. I could as easily have been lost in an endless Odyssey of cameras and nature. And now I found that just walking along a road, looking at the vegetation or whatever, produced the same result as hours of painstakingly peering through a camera lens. My mind was already somewhat lucid and I could more and more just rest in the beauty of the nature around me just as it is, and it would just present and reveal itself to me without the need of a camera. It became clear that I really didn’t need a camera at all anymore, and this at first really puzzled me. Whoa, I thought. Now I have these great cameras and all these fine lenses, and whatever technique I had managed to acquire… and I don’t need them? That’s right. That’s just what happened. It took time, but I increasingly became aware that what I had loved all this time through the photography is what was happening within my own mind. All that gear was just a scaffold to build a stable Insight-meditation practice and, once built, the camera equipment (as wonderful as it is) was just an empty cocoon as far as I was concerned, for I was now already gone beyond. I guess the moral of the story, for me anyway, is that it is easy to mistake the joy of meditation clarity with any of the objects through which that joyful clarity first appears, again, the baby and the bathwater. It is a question of priorities.